Ohio Safer Schools Tip Line - 844-SaferOH (844-723-3764) – provides students, teachers, parents and school administrators a valuable resource to report potential threats of violence, suicide or bullying of a student. Trained professionals at the Ohio Homeland Security’s Threat Assessment and Prevention (TAP) Unit administer the helpline. All calls and texts are ANONYMOUS, PRIVATE and CONFIDENTIAL, but the analysts at TAP may ask for contact information for follow-up questions. Call or text 844-SaferOH (844-723-3764) to report anything that is suspicious or endangering you, your friends or your school. When action is necessary, the analysts immediately contact local school officials and law enforcement agencies to ensure the incident is investigated and track the outcome. Research shows that in 81 percent of violent incidents in U.S. schools, someone other than the attacker had information that may have prevented the incident, but didn’t report it for fear of being identified. The assurance that calls or texts cannot be traced and that action will be taken to end the threat is helping to persuade young people to take a stand against school violence. The SaferOH tip line was launched in December 2014 by the Ohio Department of Education and the Ohio Department of Public Safety. Reynoldsburg City Schools is committed to providing a safe and caring school environment for all children. Bullying, harassment and threatening behavior are not tolerated. Students and parents are encouraged to report any issues of concern to school personnel, or to use the Safer Schools hotline to share information anonymously. 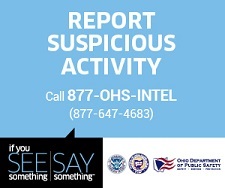 In partnership with the Department of Homeland Security, we are asking teachers, parents and students to help report suspicious behavior. To learn more about the campaign and how you can help, click here. As we begin to roll out the program, you'll start to see posters, videos and other communications, but to view all materials, click here. The U.S. Department of Health and Human Services provides comprehensive resources for teens, parents, educators and community members to help identify, prevent and stop bullying.